Thanks to additional info received from readers, some corrections have been made. They are picked out in bold itlaics. Transport Desgagnés the major Quebec shipowner has been adding new tonnage to its fleet for some time now. New-built tankers have begun to arrive, and some slightly used general cargo ships and tankers have also been added. This has allowed the company to shed some of its older ships - and not before their time by the sound of things. 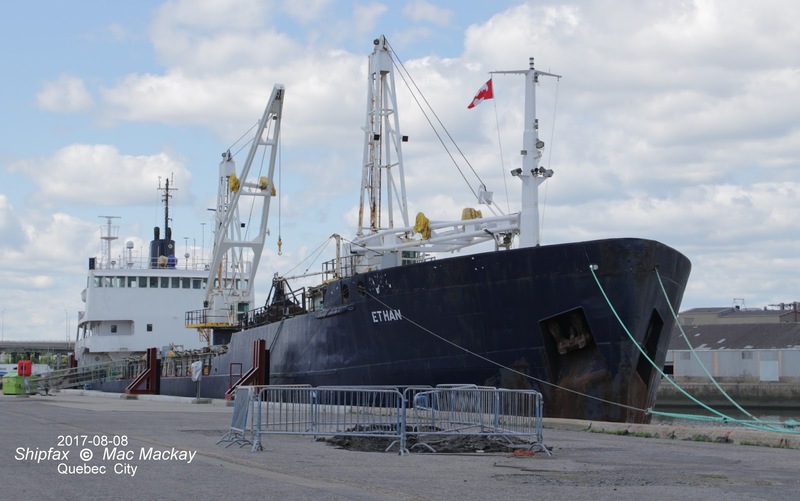 Three recently sold cargo ships in the fleet were callers in Halifax on and off over the years, but have now gone to new owners or for scrap. Amélia Desgagnés entering Pugwash harbour in ballast, drops her anchor and prepares to swing round to tie up at the Canadian Salt Mining Co berth. Amélia Desgagnés was built in 1976 by Coillingwood Shipyard as Soodoc for N.M.Paterson + Sons Ltd as a 4490 grt gearless bulk carrier. Delivered in June 1976 it made its first visit to Halifax November 11, 1976 with a load of grain. It became a regular caller, sometimes loading gypsum as a backhaul cargo. In 1977 it was fitted with two pairs of 10 tonne cranes, and was thus able to load and unload its own cargoes. It did spend some time in the late 1980s under foreign flag, returning in the summer of 1989 to Canadian flag for northern supply work. Carrying a fabrication for the Hibernia topsides project, the ship arrives in Halifax from the MIL Davie shuipyard in Lauzon where the component shell was fabricated. In 1990 Desgagnés acquired and renamed the ship, but it continued in much the same line of work, often loading salt in Pugwash, NS and going north in the summers. 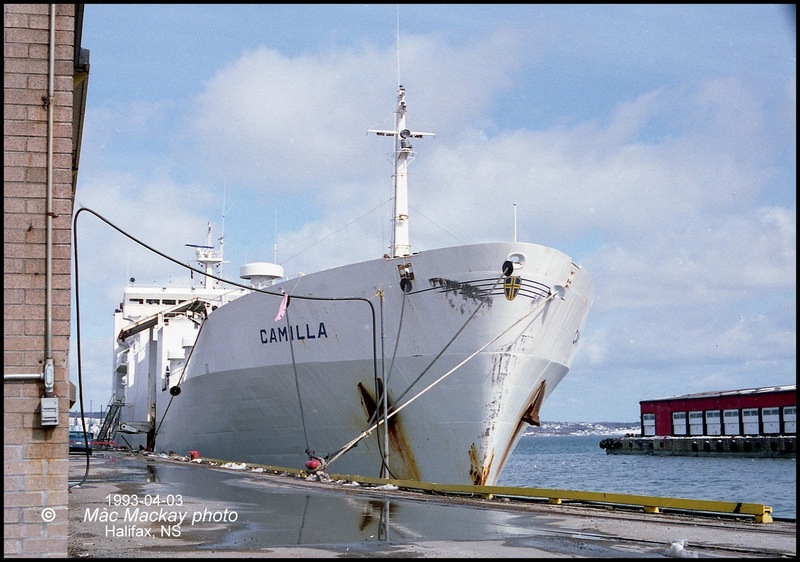 Amélia arrives in Halifax with a cargo of grain in 2001. The local milling company (then called Dover Mills) required a small quantity, and the large self-unloaders could not accommodate such a request. It was the first non-self-unloader to bring grain to Halifax since 1989. It may also have been the last. The ship was laid up in Quebec City in 2017 to be replaced by the newly acquired Argentia Desgagnés. Its register was closed June 21, 2017 and it sailed as Amelia under the Micronesian flag. It was beached in Aliaga, Turkey August 8, 2017 and subsequently scrapped. 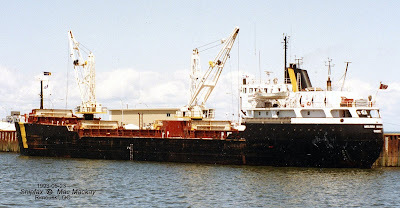 Melissa Desgagnés was a sister ship of Amélia, built as Ontadoc in Collingwood in 1975. It had essentially the same career with N.M.Paterson + Sons Ltd. It was also built as gearless bulker, but had ring mounts for cranes built on deck. But it was not until 1989 that cranes were installed. There was only a single crane on each mount, with quite prominent towers, making it easy to distinguish between the two ships. The cranes were installed in Montreal for a northern supply trip. 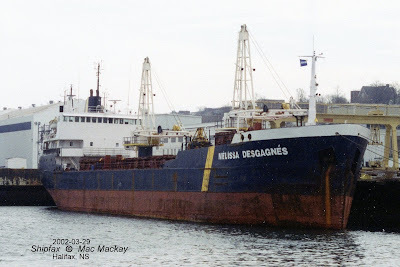 Desgagnés acquired and renamed the ship in 1990 and it continued carrying grain, ore, salt and other bulk cargoes, with yearly northern trips. On July 22, 2001 it arrived in Halifax from Port aux Basques in tow of the Magdelan Sea and the next day entered the Novadock at Halifax Shipyard. Extensive hull repairs followed. It also drydocked in the graving dock at Halifax Shipyard for nearly a month in April/May 2002 then sailed for Pugwash, NS to load salt. The ship was laid up in Quebec City in 2015 and its registry was closed July 21, 2016. 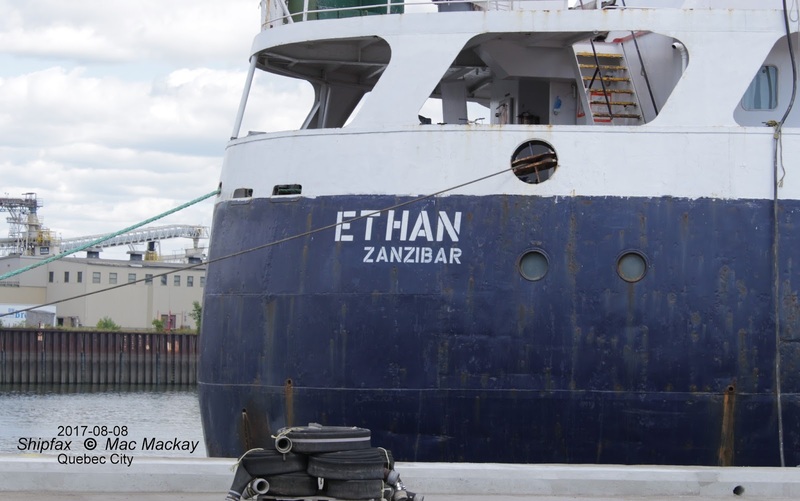 Renamed Ethan under the Tanzanian flag and registered in Zanzibar, the ship is still sitting in Quebec City awaiting final payment on the sale. Zanzibar is not a port of registry that I cannot remember seeing in Canadian waters before. Regrettably this ship never passed before my camera. Anna Desgagnés was a very different ship, built as one of the well known Astrakhan class of RoRo / cargo ships. The Warnowerft shipyard in Warnemunde produced the ship in 1986 as Truskavets. Although it flew the Cyprus flag it was owned by the USSR's Baltic fleet and traded world wide. In addition to its four 12.5 tonne cranes, it also had a 150 tonne jumbo derrick. It could carry 553 TEU containers, including 30 reefers; 232 autos or 90 truck trailers; and was rated Ice class 1. The ship arrived in Quebec City March 9, 1996 and was seized for debts. Desgagnés was the successful bidder at a sheriff's sale, reportedly paying $10 million for the versatile ship. 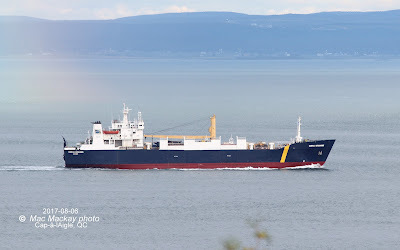 It fit well in Desgagnés northern supply work, and for many winters it was chartered out under foreign flag working for Atlantic RoRo on their St.Petersburg, Russia / US service that used several other Astrakhan ships. In 1989 it was renamed PCC Panama for a charter, but reverted to Anna Desgagnés the next year. The ship never called in Halifax to my knowledge, and spent its later years laid up in Montreal when not doing northern work. Its stern ramp made an excellent unloading dock in remote ports. The ship's register was closed June 22, 2017 and like so many Astrakhans has now been scrapped. It was beached in Aliaga, Turkey, August 9, 2017. Camilla Desgagnés returns from another northern trip. The latest ship to go has had the most checkered career of any of the Desgagnés current fleet. Built in 1982 by Kroegerwerft, Rendsburg,Germany, it was a 4681 grt RoRo paper carrier and given the name Camilla. It sailed for Lundqvist Rederierna of Finland and worked both sides of the Atlantic carrying newsprint and paper pulp, using side doors and an elevator system or its stern ramp to load. 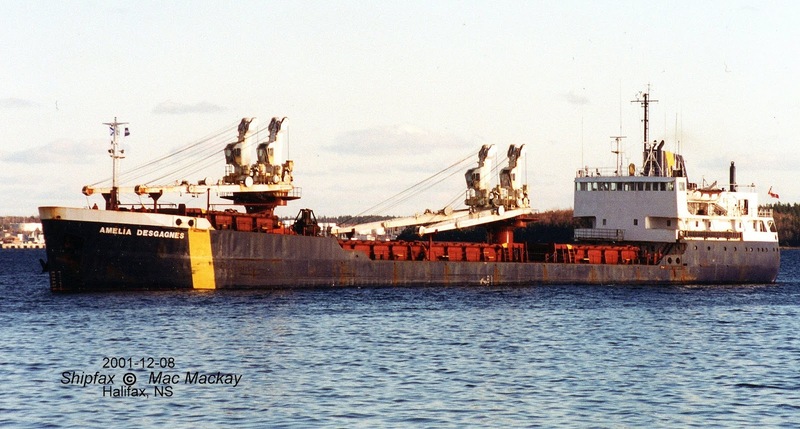 The first arrival in Halifax that I recorded was April 1, 1993 when it was towed in by Irving Cedar with a list to port and in need of hatch repairs. It was soon fixed up and on its way again. A more serious incident took place January 23, 2003 when it lost power off Newfoundland in severe weather. Unable to head up in to sea, it was rolled about and the cargo shifted, causing 20 degree severe list and a 30-40 degree roll. Due to impending sever weather and the inasability to make repairs at sea quickly enough, the master ordered an evacuation. A Cormorant helicopter airlifted all 17 persons and landed them in St.John's, NL. Titan Salvage headed up an operation that saw Ryan Leet depart Halifax the same day, joining the icebreaker/tug Kigoria (ex Canmar Kigoriak) and towing the the shiup to St.John's February 12, 2003. The ship was declared a constructive total loss and the insurers took over, renaming the ship Camilla I. Desgagnés acquired control of the ship, through Royal Bank of Canada financing and a bareboat charter.. The ship was reapired and renamed Camilla Desgagnés. After an extensive refit, (a deck crane was added later), the ship went into northern supply work, but was flagged out each winter to trade internationally. It called in Halifax in April 2005 for bunkers. On June 8, 2006 the crew extinguished an engine room fire using CO2, 20 miles off Shinecock, NY en route Poughkeepsie to Quebec. 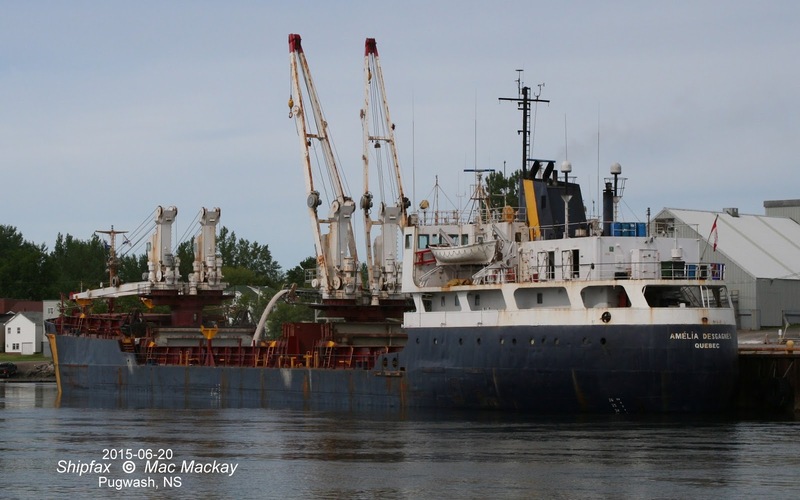 However the ship had lost all power and was towed to Port Elizabeth, NJ for repairs, Titan LLC was again responsible for the salvage and dispatched the tugs Rowan McAllister for the tow. It was joined by Amy McAllister at Ambrose and Iona McAllister at the Verrazano Bridge. The tug Océan Delta was sent from Quebed to tow it back home, wherre it was repaired and back in service for northern supply work for tis first trip in July. On its second trip north, departing from Cote-Ste-Catherine, QC August 16 it was due to call in Sept-Iles, Iqaluit, Quaswittaq (Resolute), Ikperjuk (Arctic Bay), Nanisivik and Mittimatellik (Pond Inlet). On September 7 it suffered a main engine breakdown after leaving Pond Inlet. CCGS Henry Larsen towed the ship to Milne Inlet where its own lighterage tugs were able to assist it to anchor.. The tug Océan Foxtrot was dispatched from Baie-Comeau to tow it back south, arriving in Halifax October 15. The ship spent the winter in the Novadock at Halifax Shipyard and alongside pier 9B where its engine was rebuilt. It was then reflagged to Barbados and sailed February 15 for Saint John, NB to load paper. Things seem to have relatively well for the ship after that and in September 2008 its northern supply trip extended to the Western Arctic, as far a Gjoa Haven, and without icebreaker assistance. None was needed because it was a virtually ice free, transit. It became the first commercial vessel ever to make westbound and eastbound Northwest Passages in the same year.. The ship returned to a brief drydocking in Halifax November 25-29, 2008. The on October 27, 2009 it suffered an engine explosion near the Escoumins pilot station. CCGS Hudson, CCGS Marha L. Black and the pilot boat Charlevoix assisted the ship to safe anchorage.Océan Raymond Lemay soon arrived and towed the ship on to Quebec City, arriving the next day. A broken connecting rod was the culprit, but there was also extensive damage to the engine block. However the ship was back in service for 2010. Its orginal Stork-Werkspoor 8 cyl, 5498 bhp engine was replaced with a more reliable MaK, similar to the ones found on Desgagnés ex Beluga ships. A sunburst rainbow following the ship upstream last summer. Camilla Desgagnés was laid up in 2017 in Montreal and sold in December to Russian owners. 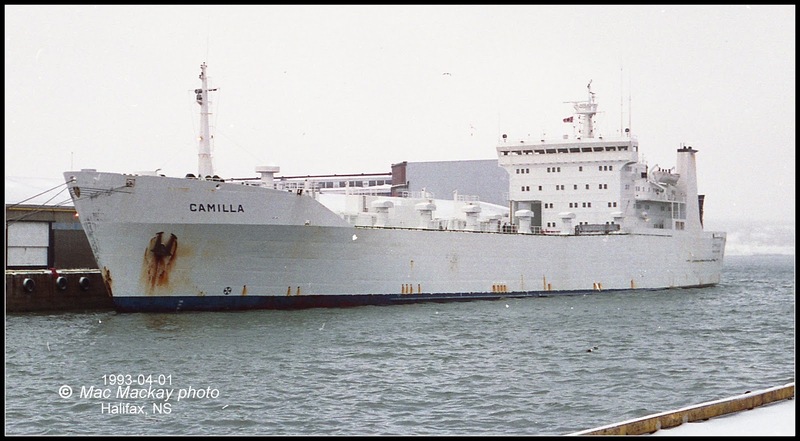 Renamed Camilla D and registered in St.Kitts and Nevis (a flag usually reserved for ships on the way to the breakers) it sailed December 30 with a Russian crew. Soon after it reported cooling problems as its sea chests were filling with ice. The ship anchored off Batiscan and after repairs went back up river to Trois-Rivières for inspection. It is reported that Ship Safety inspectors with Transport Canada had to explain to the chief engineer how to use the recirculating system (essentially routing spent (that is hot) cooling water through the sea chest intakes to prevent freezing). On December 31 the ship was underway again, still with cooling issues, then around St-Croix it suffered a gearbox failure and had to anchor to prevent grounding. The ship dragged anchor for a mile until the next day. Tugs had been sent from Quebec, but could not battle through descending ice until slack tide the next day. By this time ship was close to grounding off St-Antoine-de-Tilly. 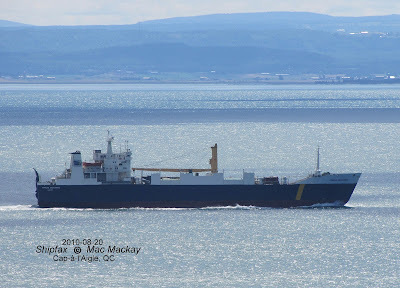 Fortunately Océan Taiga (8,000 bhp) and Océan Henry Bain (5,000 bhp), with the assistance of CCGS Pierre Radisson were able to secure the ship for towing. Because the icebreaker was needed in Quebec City (the CCGS Terry Fox was broken down), the tow headed upstream to Trois-Rivières, rendez-vousing with CCGS Des Groseillers en route. Once in Trois-Rivières, Desgagnés replaced the offending gearbox. Some of the crew, by this time having head most of the above, left (or jumped ship). Some new crew joined (including a new chief engineer), and the ship was finally ready to sail January 25. Its final downbound journey on the St.Lawrence was uneventful and the ship is now out in the ocean en route to Ust-Luga, another Russian Baltic port. The ship's finnicky Werkspoor engine, which is especially sensitive to lubricating oil quality, seems at least for the time being, to be co-operating. See update above - the original engine was replaced in 2010. Groupe Desgagnés added five ships to its fleet in 2017: the dry cargo ships Acadia Desgagnés, Arcadia Desgagnés, Nordika Desgagnés, and Taiga Desgagnés and the tanker Damia Desgagnés. It also disposed of one of its tankers, the legendary Thalassa Desgagnés. 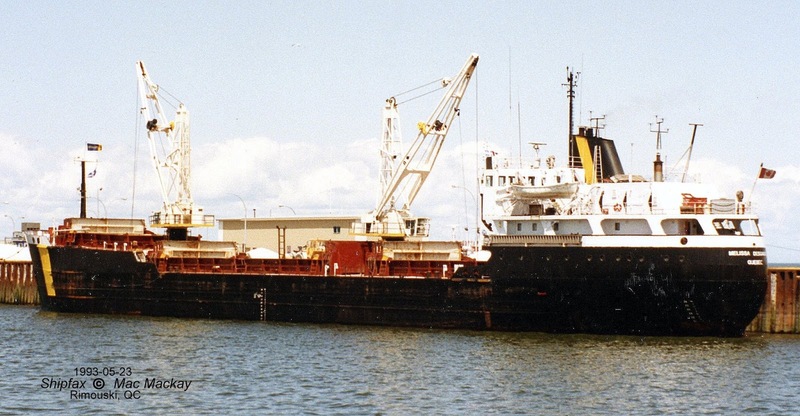 With a cargo of bunker fuel for Nova Scotia Power, Tuft's Cove, Thalassa Desgagnés was in the "dirty" oil trade, carrying bunker C, asphalt and heavy fuels. That ship has been featured here before. 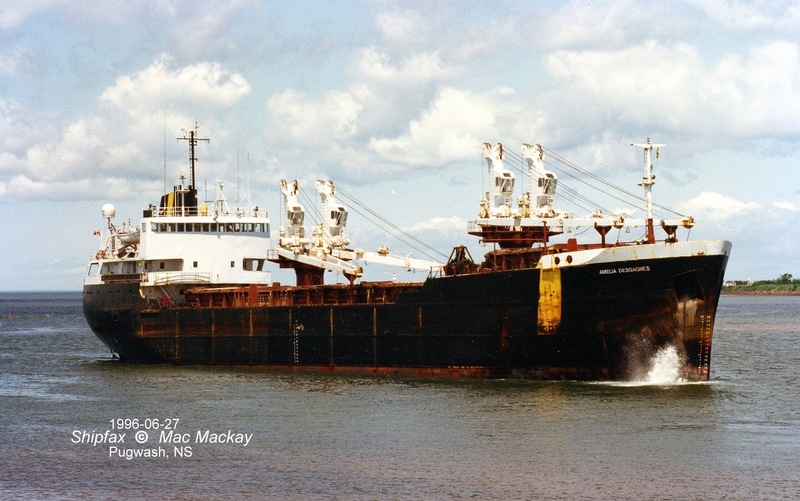 Salvaged from the shore of Anticosti Island by their own forces in 1991 after a winter aground, the then Rio Orinoco was rebuilt to start the company in the tanker business in 1993. That sort of daring-do is a thing of the past now, but the 17 year old ship gave an additional 24 years of service - a remarkable record. The tanker was laid up in Montreal last winter and in January it was reported sold. Its Canadian register was closed February 20, 2017, but the ship had already been registered in the Republic of Palau* and renamed Asphalt Princess by Asphalt Princess Shipping (under the management of Prime Tankers LLC). The ship is still trading. It's last position report was in the Arabian Sea en route from Iran to India.